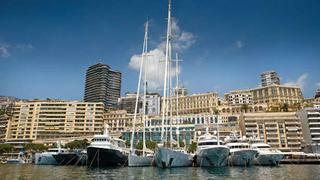 A selection of the world’s finest superyachts are lined up along the Quai des États-Unis ready for the first full day of activities at The Rendezvous in Monaco 2013, an annual event for superyacht owners and their personal guests. Formerly the ShowBoats International Rendezvous, the event has become a firm fixture on the calendars of yachting enthusiasts around the globe, bringing together like-minded owners for four days of fun on the water and relaxed social events in an exclusive setting. Attending yachts include veteran participants 38.50m Sanlorenzo 4H and 46.9m Ingot built by Burger Boat Company, Palmer Johnson’s 46m Blue Ice, the newly launched 45m Pride built by Viudes, as well as ShowBoats Design Awards 2013 finalist yachts 33.9m Only Now by Tansu and VSY’s 72.1m Stella Maris. The host yacht for the event is the 45m RMK built Karia, which will welcome guests on board for hospitality throughout the event. The programme begins on Thursday, June 20 with a private luncheon for the superyacht owners in attendance at the Yacht Club de Monaco, sponsored by R K Harrison. Bernard D’Alessandri presented memberships to the yacht club for the duration of the event, allowing owners to enjoy the fantastic facilities at one of the world’s most prestigious yachting establishments. Owners also will enjoy a tasting of fine wines, courtesy of LB Management. In true yachting tradition, day one closes with a Welcome Cocktail and Yacht Hop, with live music along the Quai des Étas-Unis creating a wonderful party atmosphere as guests stroll from one yacht to the next, reconnecting with old acquaintances and making new friends. Bartending crew onboard the yachts will enter the fun spirit of the event during the Rendezvous Cocktail Competition, each creating their own unique cocktail using Wakaya Perfection 100% Organic Ginger Power. Celebrity chefs from the Relais & Chateaux Association will join the festivities, serving some of their signature dishes on board participating yachts. Much of the Rendezvous action will take place along the Quai, which is made private to guests of the event, allowing owners to enjoy the spectacle of the superyacht fleet from close quarters. Sunshine and sea air is the programme for Friday, June 21 when the Rendezvous fleet will participate in a spectacular Cruise in Company to Saint-Jean-Cap-Ferrat, dropping anchor off the charming Paloma Beach restaurant to enjoy a day of fun à la plage with stunning views over Beaulieu and Cap d’Ail. The ShowBoats Design Awards returns to the Principality on Friday evening, taking place at the historic Monaco Opera House. Rendezvous guests will join the industry’s leading creative talents to celebrate the best in superyacht design and innovation at the annual prize giving, presented by British tennis champion Annabel Croft. The grand finale will be the famous Diamonds & White Rendezvous Party, this year hosted at the exclusive Key Largo villa in Monte Carlo. Cocktails will be served on the helipad with beautiful views overlooking Cap d'Ail and the Palais of Monaco, followed by dinner and dancing into the early hours.